The MEYTEC solution VIMED® TELEMONITOR is a web-based telemedicine application for the regular retrieval of vital signs from the home environment to the doctor in a remote location. The solution was primarily developed to optimize the care of the chronically sick persons in their natural home environment. In collaboration with medical experts it was developed as a standardized dialogue system between the affected patients and the doctor. It ensures the quality of the treatment procedures. The patient is provided with the telemedicine system locally, that receives radio signals from the relevant medical devices and transmits them to the doctor. 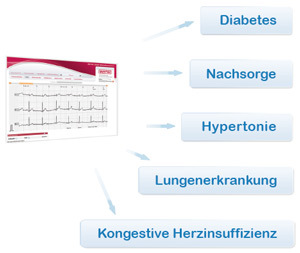 The monitoring of the vital signs is performed automatically via VIMED® TELEMEDIZINAKTE by the doctor’s practices.